>> You get 20+ Top Quality Backlinks from High Authority Sites on the Planet. 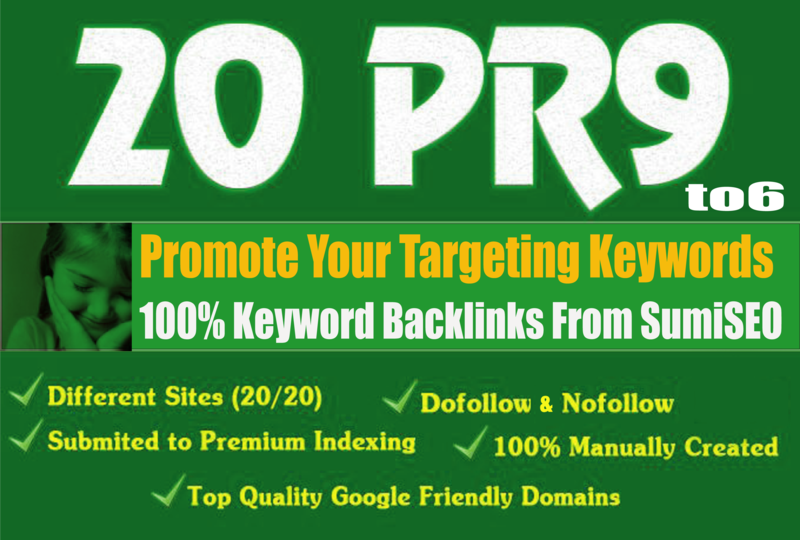 20+ web2.0 profile using top quality PR9-5 Authority Sites on the Planet (PR9 is on MAIN DOMAIN, not page), I will use your anchor text and short description whenever possible on the page. There will be a mix of no and dofollow, which is the most natural, search engine friendly technique to use. All URLs are viewable! The backlinks are created on site with PR9 of ROOT DOMAIN, not on PR99-7 page. The Back!inks are from EDU, web2.0 profiles, social networks, etc. All links are MANUALLY SUBMITTED so your Links are 100% Natural. 20 Keyword Backlinks from Authority Domain, Skyrocket Your Ranking is ranked 5 out of 5. Based on 21 user reviews.